A favorite appetizer of mine is a shrimp cocktail. 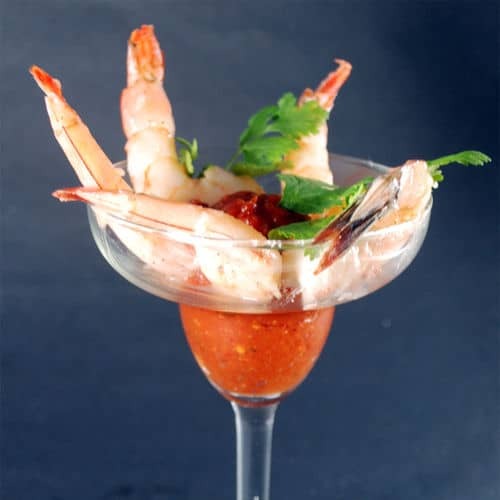 The defining features in a great shrimp cocktail are the quality of the shrimp, how well the shrimp are cooked, and the flavor of the cocktail sauce. Instead of poaching the shrimp I used sous vide shrimp for the cocktail and they turned out perfectly. The benefit of using sous vide is that you can cook the shrimp to the exact doneness you prefer. The process was very easy. I salted and peppered the raw shrimp then sealed then in a bag with some rendered guanciale fat for flavor. You could also use bacon or pancetta fat, or even just butter. You then cook the sous vide shrimp cocktail at the temperature you prefer for 15 to 35 minutes. I decided on 132°F (55.6°);C but I know many people like their shrimp cooked at 122°F (50°C). Once the sous vide shrimp cocktail is done cooking you take them out of the pouch and dry them off. You can then chill the shrimp for later serving, though I couldn't resist eating several of them hot. For the cocktail sauce I just tossed together a quick sauce in the blender by combining tomatoes, garlic, chipotle peppers, honey, and lime juice, plus some tomato paste to thicken it. It was a flavorful, smokey, and spicy cocktail sauce that complemented the flavor of the shrimp without over powering it. If you would like more information about the modernist techniques, ingredients, and equipment used in the Sous Vide Shrimp Cocktail you can check out the following. Salt and pepper the shrimp then add to a sous vide pouch with the fat. Seal the pouch. Preheat your sous vide water bath to 132°F (55.6°C). Place the pouch in the water bath for 15 to 35 minutes. Remove the sous vide shrimp cocktail from the pouch and pat dry. Place in the refrigerator until chilled. Combine all of the ingredients for the cocktail sauce in a blender or food processor. Process until it is mixed well and the consistency you prefer. Taste and adjust the flavors to your preferences. If you want it thicker you can also add more tomato paste. Remove the sous vide shrimp cocktail from the refrigerator and plate in a bowl with the cocktail sauce. Garnish with the cilantro. Cooking a sous vide shrimp cocktail is very easy and results in a tender, perfectly cooked shrimp cocktail.